The explosive talents of three Tiger Muay Thai and MMA Training Camp Phuket, Thailand alumni will be on full display this week with the all-women’s MMA promotion Invicta FC holding their event on October 6 in Kansas City, Kansas. Sarah “The Monster” D’Alelio (6-2), Cat “Alpha” Zingano (6-0), and Leslie “The Peacemaker” Smith (3-2-1) will all throwdown at the Invicta FC 3 card with the main event meeting between Jessica Penne and Naho “Sugi Rock” Sugiyam. Another alum, Elaina “The Beef” Maxwell, had to pull out of her fight because of an injury. Zingano was originally supposed to make her Strikeforce debut on September 29 after joining the promotion over the summer. An injury to main event headliner Gilbert Melendez, however, forced organizers to cancel the event. Zingano accepted a fight on October 6 and will take on Raquel “Rocky” Pennington (3-1). The American was the #1 ranked female MMA fighter at 125 lbs and had been voted Female Fighter of the Year in Colorado last year. Zingano was at TMT earlier this year, fighting in her first muay thai fight, putting on a seminar, all the while celebrating her wedding anniversary with husband Mauricio, himself a black belt in Brazilian Jiu Jitsu. D’Alelio, meanwhile, has been quietly amassing impressive wins as of late with a win against Vanessa Mariscal and a first round submission of Vanessa Porto. “The Monster” was a late replacement against Porto and shocked fans when she tapped her with a strong reverse triangle armbar. Now D’Alelio, 31, will take on Shayna Baszler (14-7) in what is sure to have number one contender implications within the young promotion. She was last at TMT in early 2012 when she came with fellow Invicta FC fighter and TMT alum Elaina Maxwell. Smith, meanwhile, was originally supposed to face Zingano but she’ll now be facing Kaitlin Young. The fighter was at Tiger Muay Thai & MMA this past January. Young fought Smith to a split draw at Invicta 1 earlier this year. Both earned a “Fight of the Night” bonus. 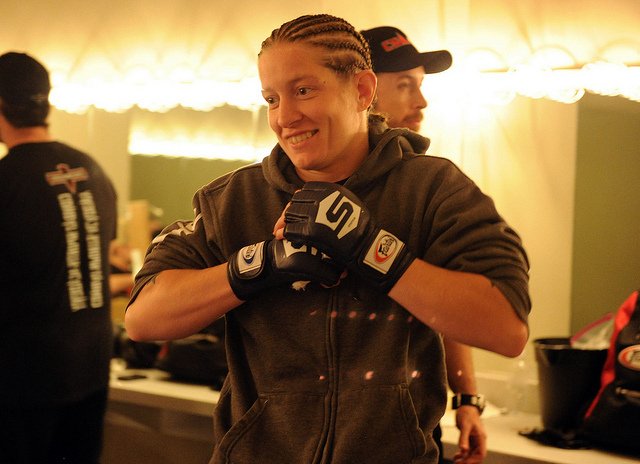 Young looks to bounce back from the following Invicta 2 loss to Liz Carmouche. Smith will be fighting for the first time since that bout.